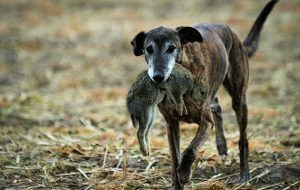 Summer may be with us, but Simon Whitehead’s day out ferreting is tinged with sadness now that his lurchers are in the autumn of their working years. 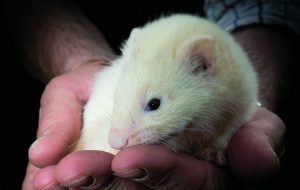 It is at this time of year when I scrutinise the strengths and weaknesses of my ferrets and ask myself questions such as which hob do i breed from to improve my stock, which hob and jill will pair up best to reinvigorate the line and what equipment needs replacing, repairing or purchasing? A successful squad does not materialise overnight, it comes with careful management and good breeding, and I know I must improve on what I already have with one eye on this time next year. The same applies to my dogs but on a longer timescale. Every four years I like to bring on a new puppy to coincide with the predecessor reaching her peak. At the other end the spectrum, I have to make the decision as to when my dog’s ferreting days have come to an end. Tawny has been taking up a lot of my time recently, whereas Bella knows what the score is. Millie, on the other hand, is a different entity altogether. At nine years old she has a lot of rabbiting mileage on her clock. Her body and mind now cannot withstand the rigours of a hard winter, but that does not totally exclude her from the odd few hours out. This is one of the beauties of ferreting; your dogs can, if managed well, continue to work even after you think their best days have gone, but you must be vigilant. Their physique may have changed, their once powerful hindquarters may have weakened and their muzzles greyed, but their nose and mind are still young. My dogs have worked hard for me and will hopefully enjoy a long and good retirement, but on the odd days they do go out, I hold them in too high an esteem to pit them against rabbits i know that they have no chance of catching. 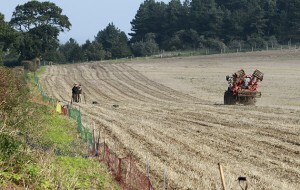 But nets, which i like to use, are perfect for aiding and abetting the mature dogs we had out recently. 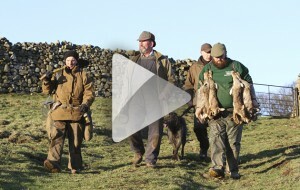 No brace of lurchers fits the bill more than the Hinge and Bracket of our rabbiting pack: my Millie and my friend Steve Taylor’s Maze. One was an out-and- out ferreting dog in her day, while the other went ferreting after time was called on her lamping career. While checking out some opened-up warrens locally, we decided to give the old girls the chance to stretch their limbs. Their speed may have long gone, but they still have their noses and combined with their experience and an understanding of how we ferret, they are still as quick over one yard as the youngsters. Their skill is knowing where to stand and when. First up was Millie. She must have known she was ferreting as she skipped down the lane, marking the warren. The bright orange long-net was laid, surrounding the structure, and a brace of neutered hob ferrets were collared up and entered. I had to be careful, though. Millie has a habit of lying down when she has had enough and just watching the rabbits, dogs and humans running about. I thought we should be okay as we only had a few places to cover and, to her credit, she had been marking the same spot since we arrived. 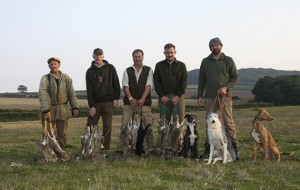 But we had yet to ascertain how many rabbits were there and what age they were. 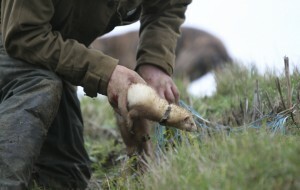 The ferrets weaved in and out under Millie’s feet, a sign that the warren was holding small, energetic young rabbits. Millie just knew what hole they were going to pop out of and they did. Over 12in, she is as quick now as when a puppy, so the bundle of grey fur that catapulted out ended up inside her mouth. It is always nice to see the older dogs work and get their rewards. She was pleased as punch. Another rabbit was pinned in the long- net before the ferrets switched off and meandered around, looking for everything but nothing, a sign that no more were at home. Millie started to wander too, so with her trip down memory lane completed, she jumped into the truck and fell asleep. It was Maze’s turn to do her bit. Of pedigree unknown, Maze is an example of how to extend the working life of a dog by tailoring her needs to her limitations. She was a late starter to ferreting having been solely used for lamping rabbits until her body could no longer withstand it. 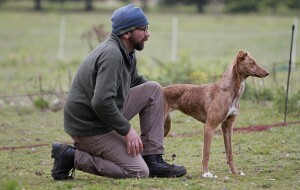 Steve’s apprehension about how an older lurcher would react to ferrets soon evaporated. It was clear she still knew the fun these little stinkers could provide and treated them accordingly. The difference in the intensity and experience between the two dogs was clear to see. Maze has always gone out for short, fun, sporty sessions, whereas Millie has been raised in the cauldron of expectancy that I work within. Why do we need a dog that marks? 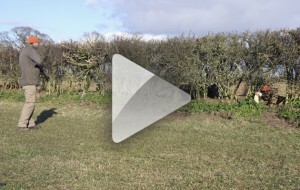 At this time of year, the rabbits move about so much at different times of the day that a warren that had adults and youngsters in the morning may not by the afternoon. The ferrets felt the mugginess of the weather and it was threatening to turn stormy, so time was of the essence. 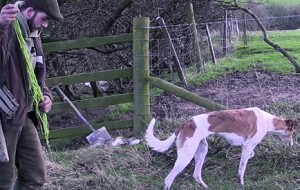 Unfortunately, juvenile rabbits can squeeze through the meshes designed for adults, so the dogs’ presence was essential. Maze was as intense as ever, marking, following the trail of the rabbit and ferrets as they did battle under the terra firma. 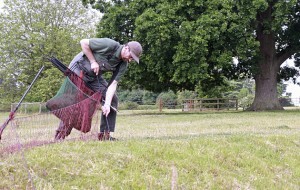 Only one rabbit came out and into the net, closely followed by Maze, and was quickly despatched by Steve. As I sat on my ferret box watching all this unfold, I felt a hint of sadness as I remembered what these dogs were like in their prime. Just as it happens with us humans, I could see their minds were still writing cheques that heir bodies could no longer bank. As the clouds moved inshore to where we were inspecting a barren hedgerow, and the rain began to lash down, the old girls broke rank. They were not interested in getting wet, and who could blame them at their age? We headed towards the woods where the bluebells were in full bloom, unlike our dogs’ careers that are well and truly on the wane. See more from Simon Whitehead’s ferreting trip with Millie and Maze on page 37 of 8 June 2016 issue of Shooting Times.